Who is the Creative Adventurer? Today it's Mother’s day in the UK. As my mum is no longer here to share this day with I’m renaming it to Earth Mother’s Day. 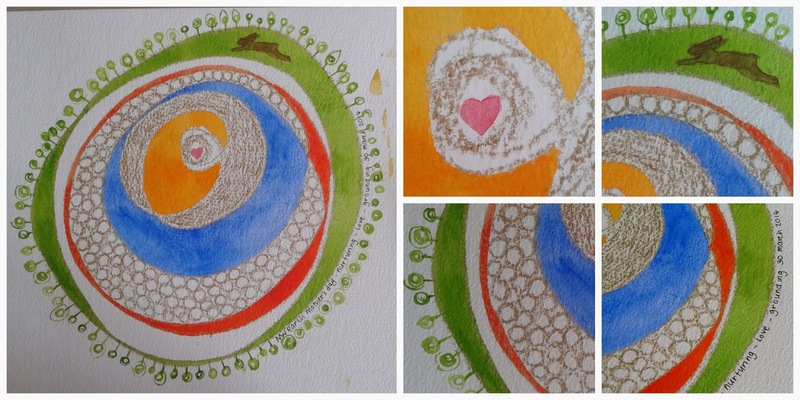 I was planning on creating a natural mandala, yet this morning I wanted to paint. So that’s what I did. I meditated and thought of my mum, then started to draw. I drew a squiggle and let the picture emerge as I added the colours. I didn't know at the beginning how it would look. I didn't have a pre-determined picture in my mind. I let it evolve. I love it. To me it says nurturing, love and grounding. I like to remember my mum before she was ill with cancer. Those days when I’d come home from school to some homemade coconut macaroons or coffee and walnut cake. My mum was a talented dressmaker, knitter and cake maker! She died when I was 15. I miss her. So in memory of my wonderful mum and to our abundant Earth Mother - Happy Earth Mother’s Day. Would you like to develop a closer connection to nature and mother earth in a creative way? Join us for a 4 week Connect to Nature: Connect to Self course starting on 12 April. What a gorgeous, loving tribute. My heart goes out to you, losing your mom at such a young age. Thank you for sharing. So what does living Exuberantly actually mean? Hello Inspiration. Do come in! Copyright Morwhenna Woolcock 2018. Awesome Inc. theme. Powered by Blogger.